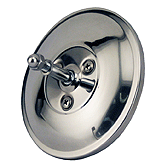 Set of round mirrors that have the chrome swan neck style arms with the polished stainless steel head. Set of 2 for right and left. These are a universal style mirror that will require the bodywork drilling and screw mounting. A nice chrome mirror that attaches in just a few minutes. Simply attaches with two set screws to the top of the door. Can be used for either the driver or the passenger side door. For the 1928-29 open cars this mirror has a 5/16" thread size and mounts in the screw hole that holds the windshield stanchion to the body. Just take the screw out and screw this mirror in place. Note: These will fit either side, but there is just not enough adjustment on the mirror head, to work well on the passenger side. Use then for cosmetic purposes only. you have been warned! Check your thread size before ordering, as some cars are not consistent on the screw sizes that were used. This mirror with the 7/16" thread, was used on the 30-1 deluxe open cars. There is a flat area about half way up on the driver side stanchion where this will mount. Clamp on straight stem mirror for the 1928-48 closed cars. This style of mirror clamps on the front of the door edge just above the hinge. 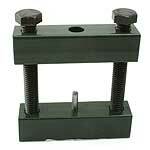 Simply clamps on with two set screws so installation is simple. 4" mirror head. Fits any closed car. Bracket is chrome and mirror head is polished stainless. Mirror Head Only for the A-17700-PS Clamp on mirror. Left side hinge mirror for the 1930-31 model A Ford coupe and sedan (not slant windsheild sedan). Similar to our A-17741-A hinge mirror except this one has an offset arm. 1.700" is the width where it slips over the top and bottom of the hinge. Chrome arm with a 4" polished stainless mirror head. Longer hinge pin included. Pin is .235" diameter. Right side hinge mirror for the 1930-31 model A Ford coupe and sedan (not slant windsheild sedan). Four inch mirror glass. Chrome plated. Universal hinge mirror for most 1928-31 model A closed cars, except the late 1931 slant windshield 4-door. 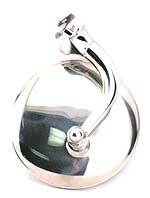 A chrome bracket with a highly polished stainless mirror head. Mount pin included. 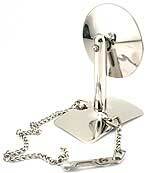 Hinge mirror Mirror Head Only for our hinge pin Mirrors. When installing hinge mirrors on a model A, a longer pin is needed. Chrome finish. (Not for Slant Windsheild 4-door). If ordering new mirrors, this pin will already be included. Black hinge pin type mirror for the closed cab commercial vehicles. 1928-29 closed cab pickup and AA trucks. A 5" diameter black mirror head for the commercial vehicles. Has a shouldered 1/4" male stud coming out the back. If your car has windwings, this chrome mirror clamps to the glass. Mounts on top of the side mount spare tyre with a leather strap. Mounts on top of the side mount spare tyre. Polished stainless with key lock. Made in USA. For the 1928-29 closed cars which used an oval headed machine screw to hold the mirror on. Made in USA. Set of 3 chrome oval headed wood screws used to mount the rear view mirror to the header. Made in USA. An exact reproduction of the original that was used in the closed cars. Held in place with 3 screws about the windshield. Comes with beveled mirror glass. Used on 1926-27 Model T's and 1928-29 Model A's. This style interior mirror was used on all 1930-31 closed cars. These are available in Powder coated black or chrome. With correct bevel on glass. Made in USA. This style interior mirror was used on all 1930-31 closed cars. These are available in Powder coated black or chrome. (Black image shown) With correct bevel on glass. Made in USA. Reproduction of the original interior mirror that was used in the 1928-29 Open cars. Fits 1930-31 open car, clamps to top of windshield frame tubing. U.S.A. made with correct bevel on glass. Mirror Glass 2 - 1/2" x 5". Replace the old cloudy mirror with a new heavy plate mirror. Very nice mirror with beveled edges. The 5" mirror is the original size, but some prefer the larger 6" which is also available. Made in USA. Mirror Glass 2 - 1/2" x 6". Replace the old cloudy mirror with a new heavy plate mirror. Very nice mirror with beveled edges. This 5" mirror is the original size, but some prefer this larger 6" version. Made in USA. Clock mirror Glass. Accesory style mirrow that is 2-1/2" x 6-1/2". Has a built-in battery powered quartz clock. Mirror edges are beveled.